2018 Top 50 True Freshman TE’s and their Impact on the Season. Today we will move on to the next position in my 2018 Top 50 True Freshman list and talk about tight ends. There was a lot less production on this list then in the previous year (21 players, 42%) as out of the Top 50, 13 (26%) of the players contributed stats for their team. Four players broke the 100 yard mark this past year. PS#7 Patrick Freiermuth came in at #1 with 368 yards, 14.2 ypc and 8 touchdowns. 2nd was Miami’s Brevin Jordan (PS#1) 287 yards, 9.0 ypc and 4 touchdowns, also receiving 2nd TM ACC honors. In at #3 was PS#46 Dallin Holker of BYU with 235 yards, 12.4 ypc and 1 touchdown. Coming in at #4 PS#42 Isaiah Smalls of Oregon St with 118 yards, 14.8 ypc. The top yards per catch in this group with at least 10 or more receptions goes to Patrick Freiermuth with 14.2 yards per catch on 26 receptions. Dallin Holker was 2nd with 12.4 ypc on 19 receptions. 3rd was Miami, FL’s Brevin Jordan with 9.0 on 32 receptions. The Top 50 tight ends from last year combined for 1,220 yards, 11.8 ypc and 15 touchdowns. You should see a lot more productions from these players in 2019. Here is the complete list of the 2018 Top 50 true frosh tight ends and what they did last year. 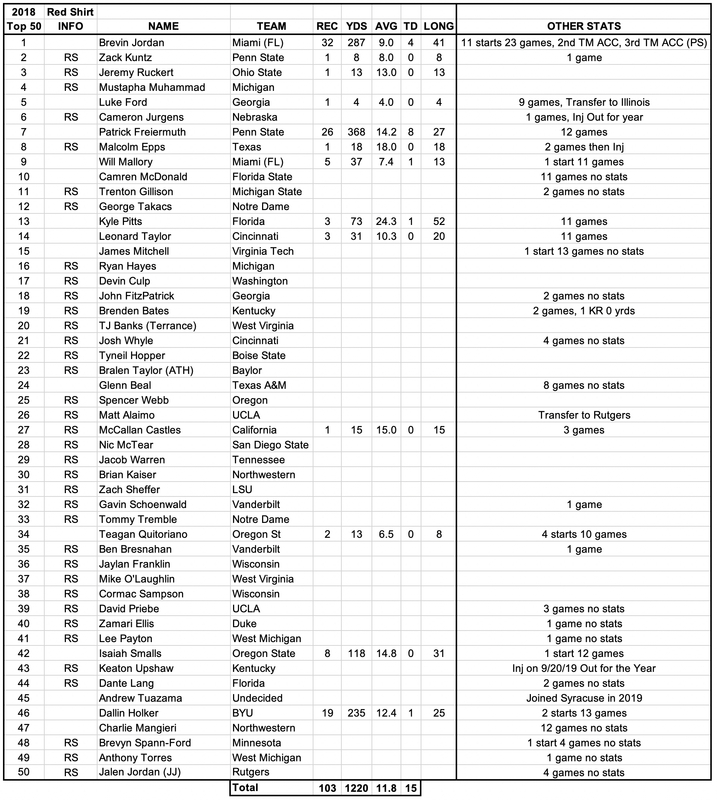 Here is the complete list of the 2019 Top 50 true frosh tight ends. Monday we will take a look at the Top 50 true freshman offensive linemen.